This past weekend, the block Mr. Lemon and I live on hosted its annual Block Party. It’s something both the kids and adults look forward to every year. From 9am – 10pm, the street is blocked off from traffic and everyone congregates in the street. The kids delight in riding their bikes up and down the road all day long. The morning is usually quite casual, then snacks after lunch and games for the kids. 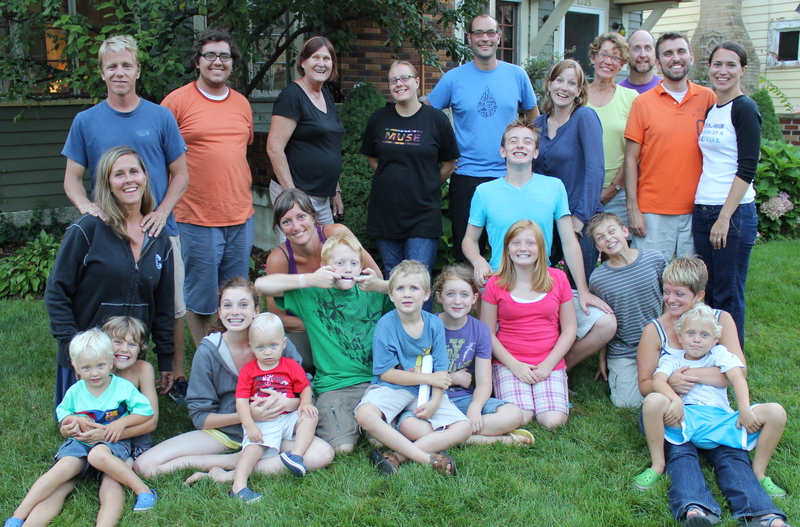 Each family is in charge of creating a game or activity for all of the kids to participate in. The Lemon household game is usually a half dozen mason jars filled with candy. 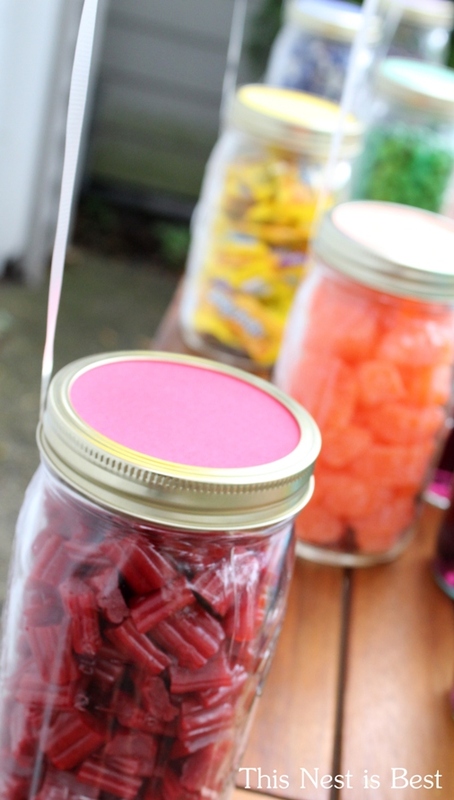 Each kid guesses how much candy is in each jar and the closest guesser wins the jar of candy. The kids have been sad when we tried another game, so now we stick to it :) After games, we have a potluck grill out and wind down around a fire. Since Mr. Lemon and I have lived here, we have been blessed with clear skies on block party Saturday. This year, however, we were not so lucky with the weather! For about an hour and a half in the early afternoon, rain, thunder and winds chased us all inside. Fortunately, we had a rainbow waiting for us once the skies cleared! 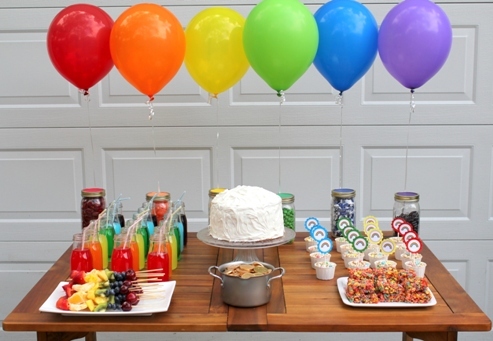 A rainbow dessert table incorporated a color coordinated candy guessing game as well as treats for those who might not be lucky enough to bring home a whole jar. 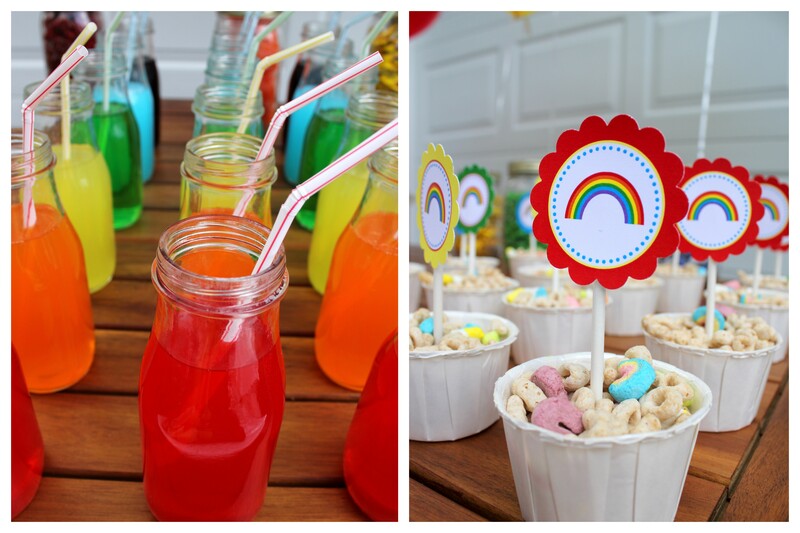 The dessert bar included an array of kool-aid drinks in milk bottles (first received here! 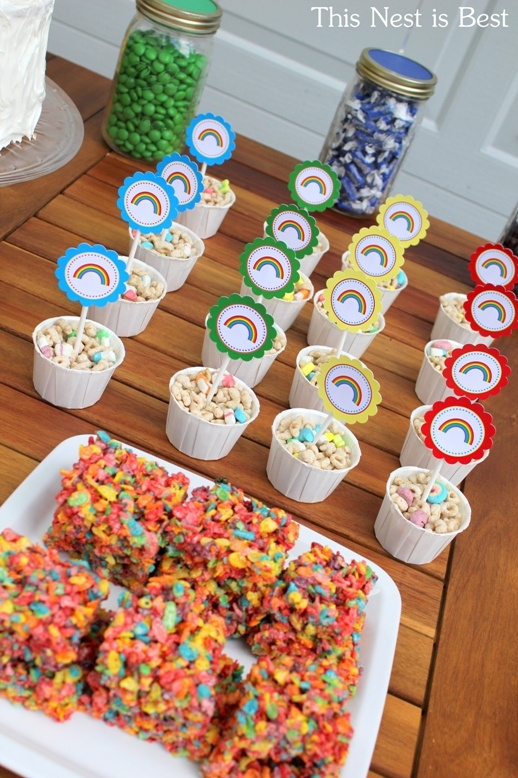 ), fruit kabobs, mini cups of Lucky Charms (with free rainbow printables from The TomKat Studio), Fruity Pebbles krispy treats, gold chocolate coins (for the end of the rainbow!) and…CAKE. 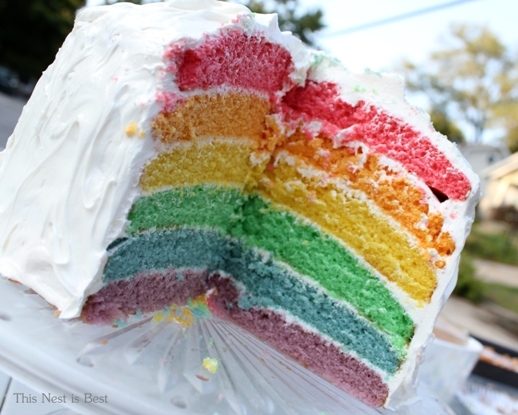 The six layer rainbow cake was a big hit with everyone at the party and so fun to cut into! As usual, block party was a great day for Mr. Lemon and I and we can’t wait until next year! 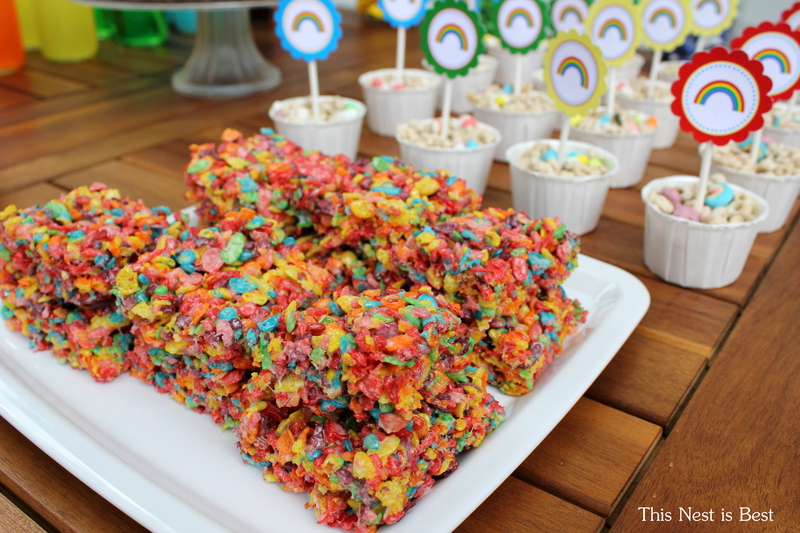 This entry was posted in Event Portfolio and tagged dessert bar. Bookmark the permalink. Holy Wow, A.MAZ.ING! 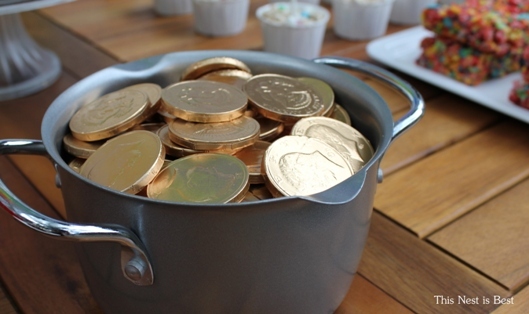 How on earth did you make that cake – hugely impressed! I really need to crash the Benjamin Ave. Block party one of these years! I love the original table by the garage! I didn’t get to see it Saturday before the chaos/fun ensued. Thanks for all the beauty!! 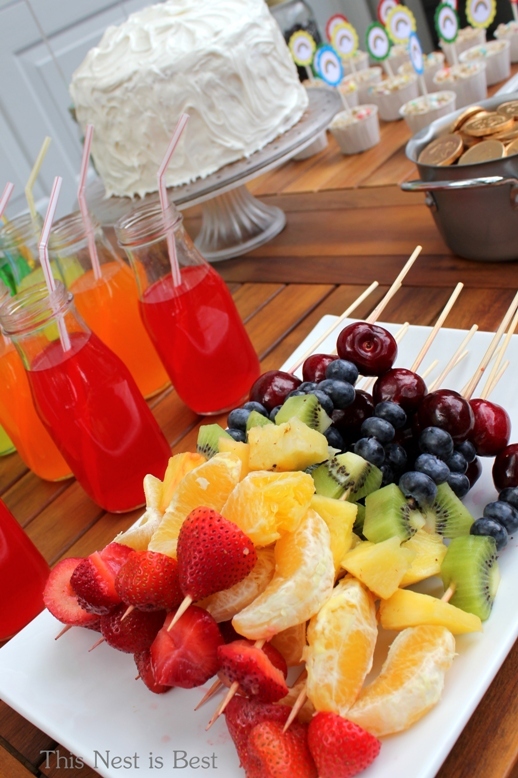 Your party turned out super cute!! Thanks for the comment! Awesome pictures! 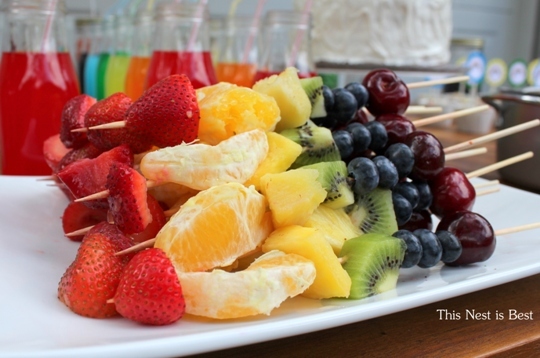 What clever ideas – especially the gold at the end of the rainbow :) Love the cake and the fruit kabobs! Thanks! Some year you guys should really come!